Improve productivity and task accuracy with hands-free scanning. Whether your workers spend their days moving products through your warehouse or retail store, or moving packages through distribution centers and onto trucks for delivery, every time they need to set an item down to check a paper work order or scan a bar code with a handheld device, their productivity decreases. 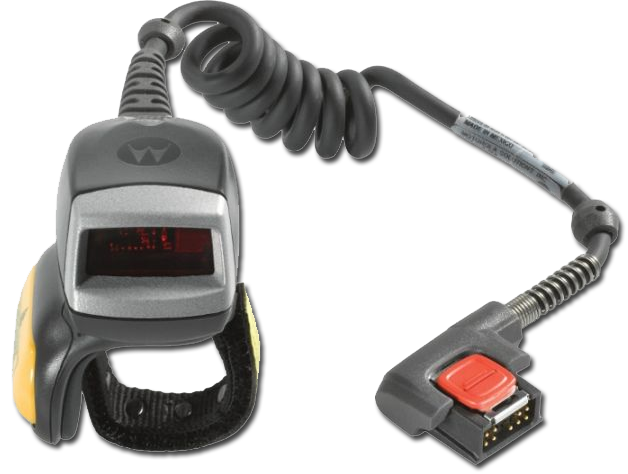 But when you put the small and lightweight RS419 1-D ring scanner on the fingers of workers who are using Zebra WT4XXX wearable mobile computers, workers are free to keep their hands and eyes on the items they are handling. Worker productivity increases. And a split-second press of the RS419 trigger also verifies task accuracy and provides the real-time inventory information you need to maintain stocking levels and reduce out-of-stocks. Innovative scanning technology allows workers to get more done in a day. Our patented Adaptive Scanning technology automatically toggles between a wide and narrow scan angle until a bar code is detected, so users can zoom in on bar codes as far as 15 ft./4.5 m and zoom out to capture bar codes at near contact ‘ the widest working range in this device class. Two scanning modes allow workers to either pull the trigger once to scan a single bar code, or keep the trigger depressed to continuously scan bar codes. Bar codes can be captured first time, every time, even if they are damaged or poorly printed ‘ and regardless of whether workers are out in the bright sunlight on a loading dock or in a dimly lit corner of a warehouse.